Mirova, an affiliate of Natixis Investment Managers dedicated to responsible investing, is pleased to announce that the GOYA project – construction of a wind farm in Arago, Spain – owned at 51% by Mirova Eurofideme 3, was named 'European Wind Deal of the Year' at the PFI Awards 2018. Project Finance International Magazine is a Thomson Reuters subsidiary and a leading source of global project finance intelligence. 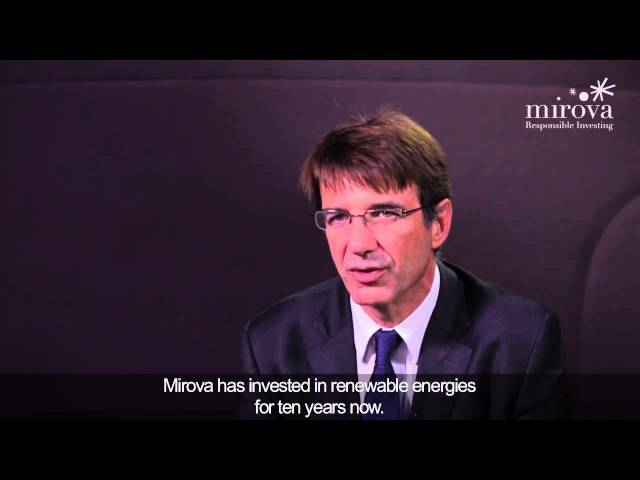 The 2018 PFI Awards Dinner, held earlier this month in London, was attended by Mirova’s Renewable Energy Team who closed this transaction. • In April 2018, Mirova Eurofideme 3, a European energy transition fund managed by Mirova, acquired a 51% equity stake of a 300MW wind portfolio ready to build near Zaragoza, Aragon, alongside General Electric (25%), Engie (15%) and Forestalia (9%). • The GOYA project was the winning bidder in Spain’s first auction for new renewables-based power generation facilities in early 2016, launched with the aim to boost the local industry whose growth was stopped by the withdrawal of public support mechanisms in 2011. • The 9 wind farms of this cluster will not benefit from any regulated tariffs or public financial supports, but has secured a 12-year private power purchase agreement with a floor price with Engie Spain. • A 120M€ bank financing was set up with a pool of Spanish banks, led by BBVA, and the European Investment Bank, which intervenes directly. • General Electric’s 3.4 and 3.8MW wind turbines will be installed while Civil and Electrical works will be provided by a consortium composed of Engie, Acciona and Copsa. • Construction started during the summer 2018 and commissioning will take place from June this year. PFI’s annual awards are one of the most prestigious and comprehensive event in the global project finance calendar. The Jury is made of PFI’s editorial team who reviews the pitches submitted by the project finance community before declaring the winner for each category. Mirova Eurofideme 3 has not been authorized by the French Financial Market Authority (“AMF”) nor by any other supervisory authority. The Fund’s investment objective, strategy and main risks are described in its regulatory documentation. Its fees, charges and performances are also described in these documents. Investments in this fund are mainly subject to loss of capital risk. The Fund is reserved for specific investors, as defined by its regulatory documentation. Any reference to a ranking and/or an award does not indicate the future performance of the fund or the fund manager.